It’s impossible to mention a good Art Heist without bringing up the most expensive private art theft of all time: the 1990 heist at the Isabella Stewart Gardner Museum. The heist celebrated its 23rd anniversary last week, which coincided with a statement released by the FBI, saying they had new information on the case and were narrowing in on suspects. But let’s back up to the beginning of the story, shall we? On the night of March 18th, 1990, at around 1:30am, two thieves dressed as policemen entered the museum through the front door, after being buzzed in by the on-duty security guard. They told the night guard he had a warrant out for his arrest, and ordered him to stand up. The guard moved away from his station, and away from the only alarm button that would have alerted police to what happened next. The thieves handcuffed him and the only other guard in the building, who had walked into the scene minutes later. When the second guard asked why he was being arrested, the thieves replied, “You’re not being arrested. This is a robbery. Don’t give us any problems and you won’t get hurt.” The two men were duct taped to pipes in the basement of the museum, and weren’t discovered until the following morning. The desperation they both must have felt, knowing they were powerless to stop the heist occurring right above them, must have been overwhelming. The two thieves spent the next 81 minutes grabbing paintings and drawings off the walls, making two trips to their car to load the stolen artwork. They pulled Rembrandt’s “Self Portrait” off the wall but couldn’t remove it from its wooden frame, so it was tossed to the floor. 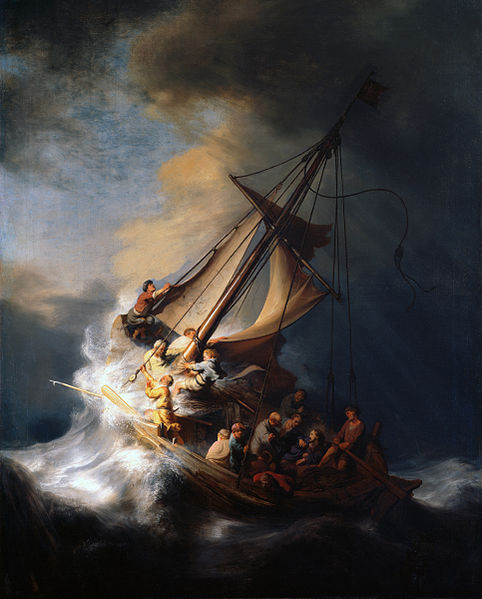 They had more luck with two other Rembrandt works, “The Storm on the Sea of Galilee” and “A Lady and Gentleman in Black” (the latter actually has a fascinating provenance debate over it, as the Rembrandt Research Project in Amsterdam does not believe it to be a legitimate work). 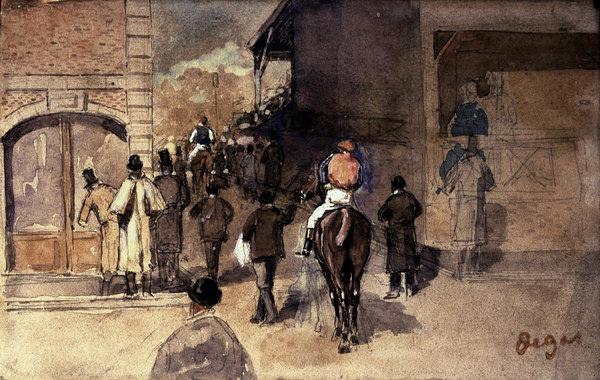 They snatched five Degas drawings, a Vermeer (one of only 34 in existence! ), “Chez Tortoni” by Manet, an ancient Chinese sculpture, and a finial from a Napoleonic flag. Thirteen pieces in all, totaling over $500 million dollars. See the full list on the on the museum’s website. 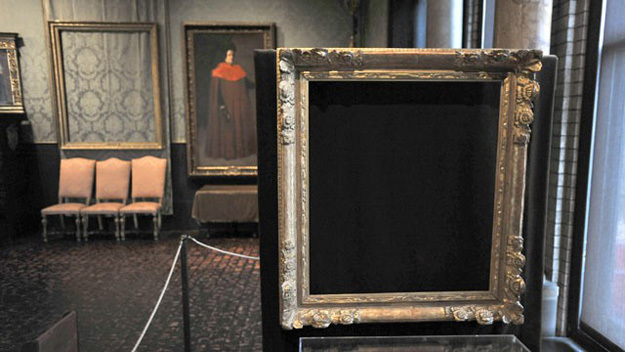 The museum left the empty frames of all stolen works on display. It’s almost eerie, isn’t it? In May of 2012, a man in Connecticut had his home raided by the FBI in connection with drug charges, but their real aim was to search his property for any of the stolen artworks, as the statute of limitations on the heist had expired. Their search came up empty. The man’s lawyer later contended his client had been set up to sell drugs by the FBI as a ruse to search his home. I love idiots. Last week, on the 23rd anniversary, the FBI made allusions to having identified those responsible for the theft, and/or in possession of the stolen pieces. The FBI believes the pieces were brought to Connecticut and the Philadelphia (!!) area after the heist. “‘It’s likely that over the years, someone – a friend, a neighbor or relative – has seen the art hanging on a wall, placed above a mantle or stored in an attic,’ Richard DesLauriers, special agent in charge of the FBI’s Boston office, told a press conference.” My question is, who sees a stolen Rembrandt in their uncle’s study and just assumes everything is kosher? I would rat out anyone, regardless of relation, when it came to stolen art. Also there’s a $5 million dollar reward. So that helps. Thank you to everyone who sent me articles about these new details in the story: Christine, Lauren, Theresa, and Jess. oh my! i feel all swept away now and want to go watch an art heist movie. i also wonder if i have any eccentric uncles in the philly area? i don’t think so but hopefully some soul in need of 5 mil dollars is able to rat out their terrible boss and save the day. i imagine it’s all been sold to different people, do you think? or do you think one person is hoarding it? xoxo! Oh wow, I love it that the museum kept the empty frames. LOVE it. Totally creepy and menacing. I’m really fascinated by what draws people to steal art…I mean I get that the thieves are likely stealing it for people who are paying them to do so, but what is it about people who want something all to themselves? It must be something akin to me and the last three chocolate chip cookies in the jar. Here’s my question. Do you have them? You can tell me. It’s just us. That’s a big one, gosh. I remember when I lived in Amsterdam one of the ad agencies had people come in during the day, they told the receptionist that they came to pick up few things and she let them in. They left with huge TV screens, laptops and other gadgets, loaded their van and took off. In broad daylight. I wish I’d know who has those paintings I would totally rat them out, I think. At least I would be tempted to get my hands on the 5 million and return the art t the museum. With that kind of money I could go on a much needed vacation, for say a year or so ;) I came across an article last week or already the week before and wanted to email it to you but always forgot. Apparently somebody in Australia pulled of an Oceans Eleven’esque casino heist. Oh, such a great art heist story! You uncovered some more juicy details that weren’t covered in The New York Times article. The photo of the empty frames hanging in the museum *is* eerie. I’m with Lauren, what does compel people to steal art and keep it all to themselves? I would love to find an article that interviews the thief and gets his side. Is it really all for the money? I’m thinking there’s more to it. PS~Nina found a casino heist! So I’m currently reading The Art Forger which is based on this heist – I’m mid-way through so I can’t recommend it yet but I’ll let you know if it’s any good. PS – I want the update on the wedding planning. Dates? Colours? Themes? Dress? DETAILS!